When Robbie Deans took the Australia post in early 2008 it was the end of an association with New Zealand rugby stretching nearly 30 years. Deans made his debut for Canterbury in 1979 and was an accomplished full back and outside half, who assumed place kicking duties for the side and racked up 1,641 career points for them. His club exploits led to him making 18 appearances for the All Blacks, including five Tests. Deans made a successful start to his coaching career, guiding Canterbury to the 1997 NPC title and their first win over Auckland in 14 years. The following year he became team manager of the Crusaders, and alongside coach Wayne Smith won his first Super Rugby title. 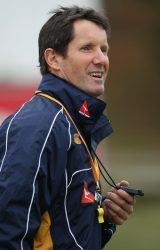 Smith left the franchise the following season, allowing Deans to take control for the new Super 12 season. He registered a second successive Super 12 title with a victory over the Brumbies whilst also coaching Canterbury to the NPC final, losing 34-29 to Wellington, and defending the famous Ranfurly Shield. In 2001 Deans chose to concentrate solely on the Super 12, but it proved to be his worst season in charge as the Crusaders limped to a disappointing tenth place. He was also appointed as assistant coach with the All Blacks during this season, working alongside John Mitchell. Under Mitchell and Deans the All Blacks won the 2002 and 2003 Tri Nations and the 2003 Bledisloe Cup. The following season Deans' Crusaders side completed a remarkable unbeaten season to claim their third Super 12 title. Following two barren seasons in 2003 and 2004, He led the Crusaders to further titles in 2005 and 2006 before signing off with a final win in 2008, his fifth, making him the most successful Super Rugby coach in history. He took the job of Australia head coach in 2008, and made a winning start in defeating touring Irish and French sides before shocking the Springboks and All Blacks in successive Tri Nations' Tests. Deans' legacy in Canterbury rugby history will be cemented in 2011 when the Deans Stand, named after him and his family, will open at AMI (Jade) Stadium.